What is fetal distress during birth? Fetal distress is a scary term to describe a situation in which your baby is having trouble it can happen during pregnancy, but fetal distress is much more common during labor and delivery. When a baby goes into fetal distress during labor and birth, his oxygen supply is jeopardized and this can be indicated by changes in the baby's heart rate. Meconium in the amniotic fluid can be seen as another indication of fetal distress during birth. What causes fetal distress? A number of factors can lead to a reduced or total lack of oxygen supply to a baby during birth. 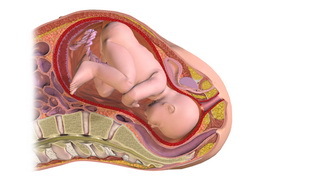 Some causes of fetal distress are a placental abruption, when the placenta detaches from the uterine wall during pregnancy or labor, the baby's cord being tightly wrapped around his neck, the cord being delivered before the baby (prolapse) and uterine rupture. Breech babies, cases of shoulder dystocia, twin births, and other unusual circumstances and positions can also contribute to fetal distress. Some medical professionals think fetal distress can be caused by medications to induce labor as well. How is it monitored and what will happen if your baby goes into distress? Electronic fetal monitoring will show your baby's heart rate during labor. In some cases, the heart rate goes down during a contraction and then fully recovers. If the heart rate is consistently slow, or other factors are present like meconium stained liquor or a change in or lack of fetal movement, your healthcare team would prefer your baby to be delivered as soon as possible. Fetal distress can lead to a cesarean section, but in some cases where birth is imminent (during shoulder dystocia, for instance) a vaginal delivery may be quicker. In some cases, the mother will be given IV fluids and oxygen to promote her own healthy blood supply, which in turn can resolve the problem. Fetal distress - what now? Meconium in the amniotic fluid - is it a danger? My daughter had an emergency c-section at 9:30 pm last night and now her face is swollen?